But this is not just any Mercury retrograde. Pluto was stationed and just hours from returning direct. Saturn and Uranus are close to exact opposition. Mars is about to cross the degree of an eclipse in July that was the first in a new series. More about all of this below. First, let’s have a quick look at what happened. 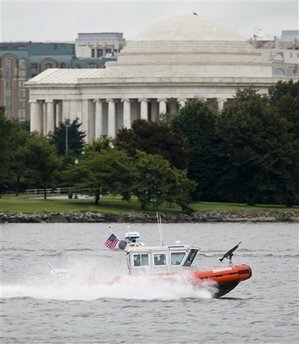 The U.S. Coast Guard was conducting what it called routine training exercises on the Potomac River, just as President Obama was arriving at the Pentagon for services commemorating the terrorist attacks of Sept. 11, 2001. The CNN newsroom heard the chatter on its police scanner and mistook it for a real attack, and other media picked up the story. CNN staff later said they tried to verify the story with the Coast Guard, who said they knew nothing. But the network made the decision to run with the story anyway. As a result, flights out of the busy D.C. airport were delayed, and even the Coast Guard was confused about whether the attack was real or just a drill. In a press briefing at the White House, Obama spokesman Robert Gibbs got into a tiff with the reporter covering the conference for CNN, blaming the incident on the network and saying they should have checked their facts before broadcasting the story. Both the White House and the Coast Guard refused to apologize for the snafu, but the Coast Guard later issued a press release saying it would conduct a full review of the incident and hinted that the boats involved in the drill may have been using the wrong radio channel to communicate with each other. Of course, any glitch in communications is automatically a function of Mercury retrograde. But this was a very big oops! I took a look at the chart for the event, which, according to news reports, began at 9:30 a.m. The Ascendant is 21 degrees Libra, with Mercury retrograde in the twelfth house, the sector ruled by Neptune, the confusion planet and also one of the two planets that rules shipping. Jupiter is the other, and chart ruler Venus was exactly opposite Jupiter, who is retrograde but still in close conjunction with Neptune. Pluto was three hours from returning direct after five months retrograde. He’s stationed at 0 degrees Capricorn, in the third house, which concerns communications, and he’s square retrograde Mercury. In the original chart for the 9/11 attacks, Pluto was in close opposition with Saturn, which many astrologers considered a key indicator of the attacks, since Pluto rules subversive elements in society. In yesterday’s chart, Pluto also is in wide opposition to war planet Mars at 10 degrees Cancer, the closest planet to the Midheaven at 24 degrees Cancer. The United States is a Cancer nation, concerned with security, a keyword for Cancer. The ninth house, where Mars is located in this chart, includes training and improving skills. That all chart four angles are in cardinal signs is a clue to what this event might signify, other than just a very big Mercury retrograde mistake. Mars is about to cross the degree of the lunar eclipse of July 7, which was the first in a new series of eclipses in Capricorn and Cancer. These eclipses are going to amplify the cardinal energy of 2010, when Saturn, Uranus, and Pluto form a T-square in Libra, Aries, and Capricorn. The handwriting is appearing on the wall, and it’s starting to look like a road sign for how to move forward. There are two other interesting things to note about this chart. First, Ceres is on the Ascendant, signifying that wisdom ultimately prevailed. We may not always be this lucky, but we can hope, and perhaps as more women take up positions at high levels of government, we’ll adopt a more balanced approach to war and national defense. Second, Comet Lulin is lurking in the background. On Sept. 11, 2001, Lulin was at 24 degrees Pisces, which is where Uranus currently is sitting and where he’ll be opposed by Saturn next week. Lulin conjoined Saturn in late February at 20 degrees Virgo. At the time, Saturn was the only planet retrograde, which was notable, because Lulin moves backwards, unlike any other known comet. Now Saturn is moving forward and Uranus is retrograde. There seems to be a message here about going back, remembering, and understanding how we got where we are as a prerequisite to moving forward. Mars and Lulin will conjoin at 17 degrees Cancer on September 24. I don’t know if we’ll see any effects, but keep your eyes and ears open for anything that improves our understanding about past events or how we got to be the way we are. Meanwhile, perhaps there’s a clue in a statement to the media by the Coast Guard’s chief of staff, John Currier, following yesterday’s mix-up. “We’re going to take a good hard look at what we did here today and ensure that if we need to modify procedures, if we need to modify notification, we will do so in the future,” he said. Image: The U.S. Coast Guard conducting drills on the Potomac River in Washington, D.C., on Sept. 11, 2009. Photo by Kevin Wolf for The Associated Press. This entry was posted in About astrology, Forecasts, Saturday Extra! and tagged cardinal T-square, Mercury retrograde, Pluto in Capricorn on September 12, 2009 by Pat.